HealthDrone is a three-year innovation project funded by Innovation Fund Denmark. The aim is to develop and test HealthDrones to transport patient samples, medicine and medical equipment between hospital units, medical practices and home-visiting nurses. In the long term, drones will also transport persons, such as highly specialized doctors, who may be acutely lacking in an operating room. The initial tests of the health drones will be carried out in the UAS Test Center in HCA Airport by Odense. Later the health drones will be tested in a corridor between Ærø, Svendborg and Odense. The researchers expect the health drones to fly the route between Svendborg hospital and Odense University hospital in less than an hour. Today the transport time of patient samples is an average of 12 hours. When ready, the health drones will improve the logistics in the healthcare sector and assure faster and better treatment for the patients. The drones will enable more examinations to be conducted at the medical practices or at home, instead of at the hospitals. 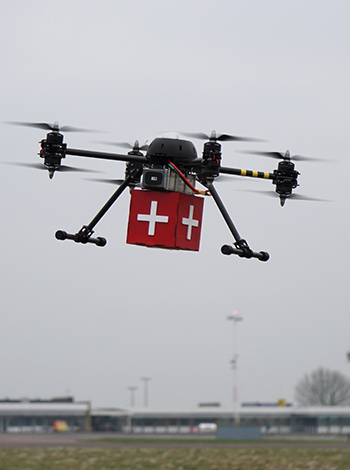 The use of health drones is expected to save the Danish hospital sector 200 million DKK per year. Funding: Supported by Innovation Fund Denmark with a grant of 14 mio. DKK and a total budget of more than 30 mio. DKK. Partners: Autonomous Mobility A/S, Falck A/S, Unifly, Scandinavian Avionics A/S, Odense University Hospital (OUH), and University of Southern Denmark (SDU).